Product #16855 | SKU FS2 | 0.0 (no ratings yet) Thanks for your rating! 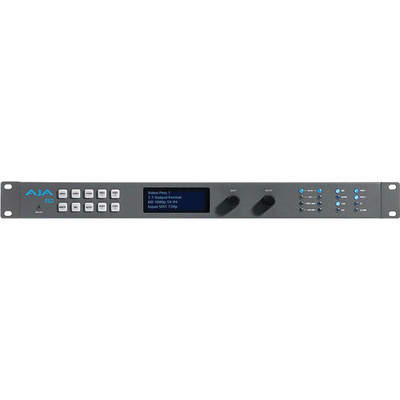 The AJA FS2 Dual Channel Frame Synchroniser and Convertor supports two independent streams of 3G/HD/SD 10-bit Broadcast quality video and two independent groups of 16-channel AES audio simultaneously. Each individual video channel supports analogue component or composite, 3G/HD/SD-SDI, Dual-Link, and HDMI I/O inputs/outputs. You can use the FS2 as two separate frame synchronisers/format convertors, or the two channels can be linked with the internal keyer to do the work of multiple devices, such as HD sidebar keying where both the video and background graphics are up converted and combined. Each channel features still-store, keyer, and video proc amp/colour corrector offering more expansion options. Supporting a wide range of broadcast formats, the FS2 Frame Synchroniser and Convertor can be used for applications such as broadcast facilities, production trucks, video and audio signal conversion, adaptation, timing, and processing. It supports down-conversion between HD/SD and cross-conversion between HD formats, including 3G 1080p50/60 formats. In addition, the FS2 features full input and output signal routing that allows any I/O port to be assigned to any of the processing channels. Featuring two audio processors, with each processor supporting 16-channel AES/EBU digital audio, 16-channel embedded audio, and 8-channel balanced analogue audio, the FS2 offers variety of audio control. It supports closed captioning indicating presence of closed captioning data in the video signal. In addition, the unit also supports conversion between SD and HD formats (including full conversion between CEA-608 and CEA-708 caption standards). AJA FS units are network ready and supports SNMP monitoring and web-based remote control. They can be connected to any Ethernet network via the built-in 10/100/1000 Mb/s Ethernet port, allowing control and configuration of multiple FS units from any web browser on a connected computer. Configurations can be saved and applied to multiple units, ensuring consistency and quick configuration in large instals. For integration with existing automation systems, the FS2 can also receive external GPI commands to trigger a variety of functions, from freezing an input source to switching between saved presets. Dual, redundant power supplies, 55 W typical, 80 W max., 15 A max.